Eliot Burying ground dates from 1630. 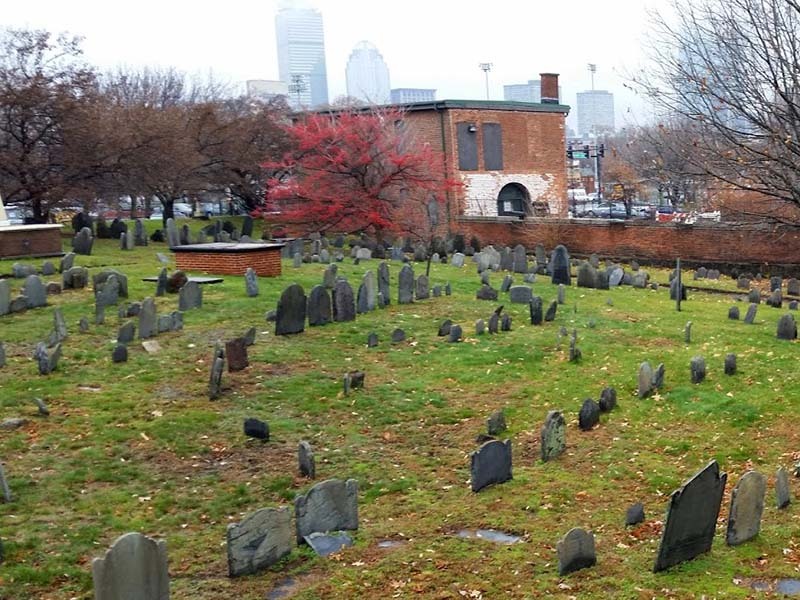 Formerly known as Old Roxbury Burying Ground and Eustis Street Burying Ground, it is the oldest burying ground in Roxbury and one of the three oldest of Boston's historic burying grounds with the first interment made in 1633. This burying ground was the site of the Roxbury Neck fortifications. At the time of the siege of Boston, American colonists built a redoubt in 1775 to defend the road to Dorchester and the entrance to the town of Roxbury. It extended from Eustis Street across Washington Street, and was called the Burying Ground Redoubt. Interments ceased here in 1854 except those made in family tombs. In 1857 the town built the external wall and gate and made landscaping improvements, including pathways and trees. Near the Eustis Street entrance is the Dudley family tomb for early Colonial governors. Buried there are Governor Thomas Dudley , Governor Joseph Dudley , Chief Justice Paul Dudley  and Colonel William Dudley . The Dudley tomb is covered with an oval marble slab which took the place of the original plate of pewter that was cut out by American soldiers of the Roxbury camp during the siege of Boston and made into bullets. The Minister's or Parish Tomb contains the site's namesake, John Eliot, apostle to the Indians , and five later ministers of the First Church of Roxbury. Benjamin Thompson, schoolmaster and physician , is also buried there as well as generations of early Roxbury families. Baker, Thomas, Lot: D-353, d. "14, 1683"
Bridg, Mar-rea, Lot: D359, d. "19, 1671"
Chandlar, John, Lot: A16, d. 10/15/166?